Bowser's Shocking Slipup is a Boss Battle minigame from Mario Party: Star Rush. It is one of the three Bowser-themed Boss Battle minigames in the game. 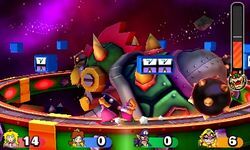 Players run in a straight line around Bowser, where they need to hit rotating Item Boxes to launch Lightning at him. Players need to time their jumps to hit the Item Box when it displays the Lightning Bolt icon. If players hit the Banana Peel icon instead, Banana Peels fly out of the Item Box. If players slip on Banana Peels, they get stunned momentarily. After an Item Box has been hit, it has a three second cool-down time indicated by numbers displayed on the Item Box before it can be hit again. The number of items is dependent on how big the Item Box is: most blocks have one item, but double Item Boxes can use two. Bowser can either breathe fireballs at the players or send missiles flying into the arena; whichever player gets hit by Bowser's fireballs or missiles loses a point. When Bowser has half of his health depleted, he turns his machine into a Bowser mech. Here, he can launch large Spiked Balls into the arena that can roll after players, where players need to move in one direction to avoid it. Bowser can also use lasers to attack players; players can dodge it by constantly moving. The item roulette also spins faster, making it more difficult for players to hit the Lightning Bolts on the Item Boxes. Whichever player deals the final blow to Bowser earns an additional three bonus points. When Bowser is defeated, his mech gets destroyed, with Bowser flying away and turning into a star. In Toad Scramble, Bowser drops two Stars. On-screen (Before game starts) – "Hit the Item Boxes to give Bowser a shock!"